2008 Triumph Bonneville Black. Picture credits - Triumph. Submit more pictures. A true roadster in every sense of the word, the Bonneville matches classic British style to 21st century technology. This pairing of authenticity with modernity has led the Bonneville to become an icon in its own right with several designers, such as Paul Smith and Patrick Cox, creating their own signature tank designs. Fuel system: Carburettor. Twin carburettors with throttle position sensor and electric carburettor heaters. Ask questions Join the 08 Triumph Bonneville Black discussion group or the general Triumph discussion group. Get a list of related motorbikes before you buy this Triumph. Inspect technical data. Look at photos. Read the riders' comments at the bike's discussion group. And check out the bike's reliability, repair costs, etc. 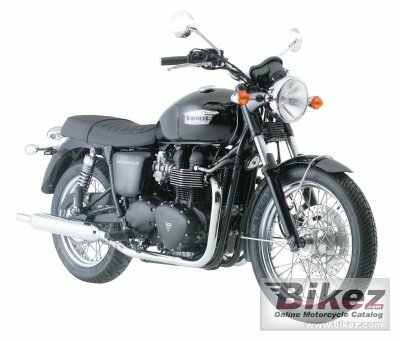 Show any 2008 Triumph Bonneville Black for sale on our Bikez.biz Motorcycle Classifieds. You can also sign up for e-mail notification when such bikes are advertised in the future. And advertise your old MC for sale. Our efficient ads are free. You are also welcome to read and submit motorcycle reviews.